Ideally you want to be able to run larger injectors at a lower fuel pressure, however, without additional fuel management this is not possible. The stock ECU has some wiggle room to run a larger injector; the 1.6 ECU should be able to idle up to 305cc injectors. However, it will require tweaking the AFM idle-mixture settings and spring tension. Any +94 miata should have the wiggle room built in to idle +10/15% larger injectors. There's nothing you can really fool with to trick the ECU to properly run anything larger. 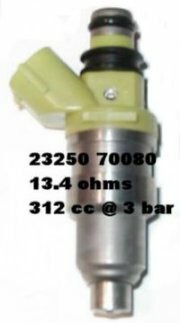 If you notice the body shape of the 99+ injector they are a more desirable injector due to the pintle design; they atomize fuel better. 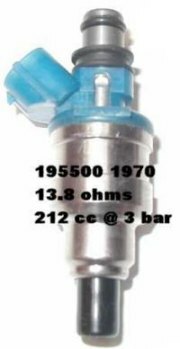 If you are using a “piggyback” fuel management unit such as the BEGI or Vortech FMU, the popular injector to use is a 305cc injector from the Supra. Plug and play injectors from other cars are necessarily going to be from the same era as the miata, since modern cars aren't built with the same type of denso injectors. That means they are a few generations older, and you will sacrifice spray pattern (atomization) and idle quality. This is the cheapest option though, so if budget is your number one consideration then you can go this route. The most common scrap yard injectors are 420cc yellow tops from an RX8, followed by 460cc or 550cc injectors from an RX7 turbo. The 460s should be able to support around 250rwhp, the 550s around 300rwhp at stock fuel pressure levels. 2018 Update: The market has been flooded with poor performing knock off RX8 injectors. eBay listings should generally not be trusted, so to acquire RX8 injectors it is highly recommended to remove them from a car yourself, or buy from a highly trusted source who removes them from scrapped cars. Do not buy new RX8 injectors. The Miata uses high ohm injectors. Also know as saturated injectors. 89-91 B2220 Truck 224cc - Yellow Top? #23250-74040? 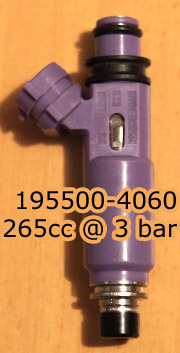 The same connector shape can be found on low ohm injectors, but they require wiring in resistors to increase the resistance and filing down the tabs on the sides of the injectors. As you can see, the location of the tab on the connector are in different locations. Simple filing them down allows the direct plug in of these types of injectors. Some aftermarket ECUs have the ability to control Low Ohm injectors. Otherwise, it's easier to stick with the High Ohm lot. Bosch EV14 injectors are the most modern port injection injectors available today and are used by most OEMs. Major advancements in fuel injection technology have been made in the past 20 years, and the result is well worth it. They have better atomization and will idle better than stock when well tuned. To make run them in a miata, you need several adapter pieces. Prices range from about $240 if you go DIY, $239-$449 for a plug and play and flow matched set from Flow Force, to $520-$568 for flow matched 725cc or 1050cc units from Injector Dynamics. 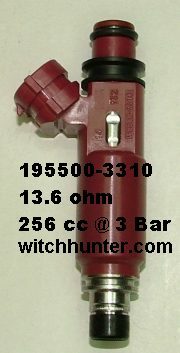 connectors - must be EV6/EV14 female to Denso male, and be the type with wires between the ends. The solid type connector doesn't fit under the stock fuel rail. 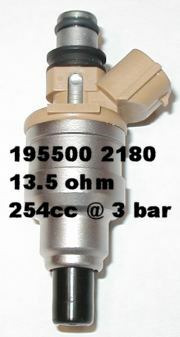 Each of these parts can be found on eBay, from Flow Force Injectors, or from Injector Dynamics. There are flow matched plug and play kits available from multiple suppliers. Popular suppliers are Flow Force Injectors with 380cc ($239), 640cc ($319) and 960cc ($449) kits, and Injector Dynamics with 725cc ($520) and 1050cc ($568) kits. In most cases a turbocharged engine will have a B.S.F.C of .60. B.S.F.C is brake specific fuel consumption; How much fuel you are using per horsepower per hour. This means that the engine will use .60 lbs. of fuel per hour for each horsepower it produces. Using .55 for the Miata seems to result in more accurate calculations. 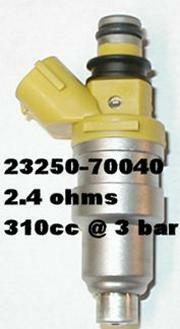 Most injectors will max out at 80-85% duty cycle and this is the accepted industry standard. At 6psi with a 8:1 ratio FMU we will have about 96psi of fuel @ the rail. We will use that to find an injector that will flow 360cc at 96psi. That means at 96psi a 265cc injector will supply the needed 360cc (and a little extra breathing room) to reach 200 HP (165rwhp). So the 1.6 injectors will be short of our target to supply enough fuel for 200BHP even at 120psi of fuel at the rail.